Arsene Wenger says finishing second in the Premier League is not out of Arsenal's reach. 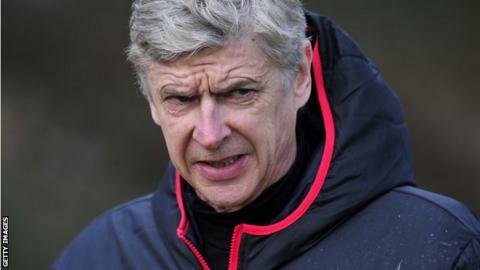 Wenger has recently seen his side beaten by Blackburn in the FA Cup and Bayern Munich in the Champions League. But he believes they can secure the runners-up spot in the league, despite being nine points behind second-placed Manchester City with 11 games left. "Man City is not out of reach. It could be a tight fight until the end," said the Arsenal boss. Despite enduring a torrid time last week in cup competition, Arsenal's 2-1 win over Aston Villa on Saturday was their third straight league success, following victories against Sunderland and Stoke. Yet they remain fifth in the table, behind City, Chelsea and Tottenham ahead of the north London derby at White Hart Lane on 3 March. Tottenham start Monday's game at West Ham in fourth, one point ahead of Arsenal but knowing victory at Upton Park will lift them two points above third-placed Chelsea. Manchester United, who Arsenal still have to play at Emirates Stadium on 28 April, are 21 points clear of the Gunners at the top of the table. Chelsea interim manager Rafael Benitez suggested before his team's 2-0 defeat at Manchester City on Sunday that a top-two finish could be out of reach if the Blues lost at Etihad Stadium. "We have to go there with confidence and if we are close we can fight for being in the top two," said Benitez before the weekend. "And if not we have to fight for being in the top four." Yet Wenger believes his team can not only overtake Tottenham and Chelsea but also overhaul City and qualify automatically for a place in next season's Champions League group stage. "I'm not sure it will only be a fight with Tottenham," he added when asked about the battle for fourth. "I'm not sure the other places are not reachable. "Chelsea are just ahead and even Manchester City is not out of reach. It could be a tight fight until the end." Arsenal have not finished outside the Premier League's top four since Wenger took charge in September 1996. The last time they ended the season in the top two was in 2004-05 when they were runners-up to Chelsea.